It looked like VAB(Vehicle Assembly Building) for space shuttle from the distance. Actually, this is the Integrated Political Administration Center of Binh Duong. Planned to open 20th Feb 2014. 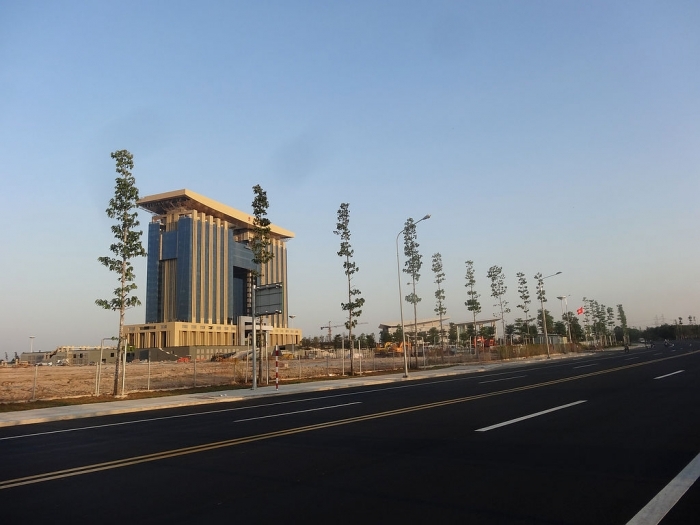 On February 20th 2014, The inauguration ceremony of Integrated Political Administration Center of Binh Duong - The Gate Building - will be celebrated at the center of Binh Duong New City Binh Duong People Committee. This project has started construction on November 2010 whereas the Gate building is a building with 23 storey including 2 storey for parking; 21 storey for office. In additional, there is also a technical storey and a heliport on roof of this building. The detail of planned building can be obtained from the following pages. According to someone's plan, Binh Duong New city will be the 2 million population's town despite current total population of Binh Duong province is 1.7 million. If Vietnam will be able to continue to develop next 5 to 10 years, and new international airport will be built, then this town could be full of people as a satellite city of Ho Chi Minh city.